Does Your Cat Hate Going To A Cattery? Are You Fed Up Asking Friends & Family to Call In And Check On Them? Maybe You Have Stopped Going Away Because You Don’t Have Anyone To Care For Them. Why Not Hire A Cat Sitter! When you use a Cat Sitting service your cat gets to stay at home in their normal surroundings, getting their normal food and playtime. We call as many times a day as you need to make sure you get is happy and your home is secure. Your cat gets to stay in their own home, meaning no trips in the car. You don’t have to ask friends to pop in and feed them. Your home is checked on daily to keep it secure and looking lived in while you are away. Your cat keeps their normal routine. It’s less hassle for you, just head away on your trip and we take care of the rest. 1 to 1 love and cuddles and games if that’s what your cat likes. If not, no problem we won’t force them to play! Daily updates and pictures, with full office support if you need to contact us at any stage. 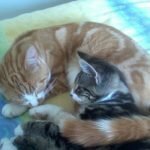 My cats are very nervous so a cattery would be out of the question. It’s great being able go get away and not having to worry and getting photos and the updates just proves they’re in good hands. Also knowing my house is secure is an added bonus.